(Carlisle, PA) On Friday, February 1, 2019, there will be public open house and exhibit launch in the House Divided Studio at 61 N. West Street from 10am to 4pm. 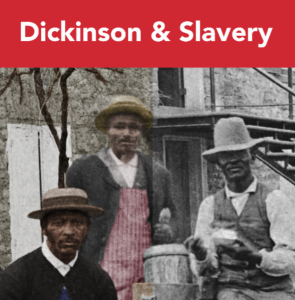 The new “Dickinson and Slavery” exhibit will feature special panels that commemorate the college’s ties to slavery as well as provide an extended discussion about the former slaves and descendants who later became an essential part of the Dickinson community following the Civil War. Visitors will learn, for example, about the remarkable story of Robert Young, the longest serving college employee of the nineteenth century. 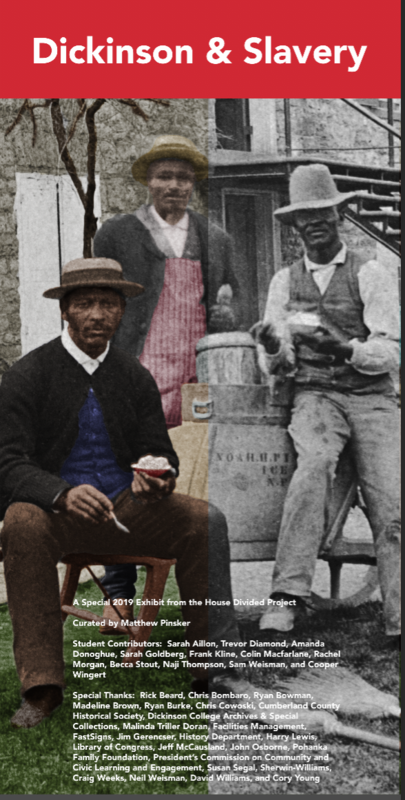 Young was a former slave who fought to get his eldest son admitted to the college in the 1880s, during a period when integration of American higher education was still rare and considered controversial. They will discover new details from the life of Henry W. Spradley, a former escaped slave, Union army veteran, and longtime college janitor, whose death in 1897 was marked on campus by canceling classes and holding an all-community memorial service. And finally, visitors will experience the sometimes-complicated affection that generations of Dickinson students held for a former enslaved man, Noah Pinkney, and his wife Carrie (“Aunt Noah”), who provided food and refreshments on the west side of Carlisle into the early twentieth century. The exhibit has a companion website built for classroom application also currently available to the public. Curated by Matthew Pinsker, with student contributions from Sarah Aillon (Class of 2019), Trevor Diamond (Class of 2017), Amanda Donoghue (Class of 2019), Frank Kline (Class of 2019), Colin Macfarlane (Class of 2012), Rachel Morgan (Class of 2018), Sarah Goldberg (Class of 2018), Becca Stout (Class of 2019), Naji Thompson (Class of 2019), Sam Weisman (Class of 2018), and Cooper Wingert (Class of 2020), the Dickinson & Slavery exhibit will remain installed at the House Divided studio indefinitely and will be open to the public and various on- and 0ff-campus groups on most Wednesdays from 9am to 12pm and by appointment. The House Divided Project can be reached by email, hdivided@dickinson.edu or by telephone, 717-245-1865.